These are a beautful 63% Silk/37% Wool Scarves. 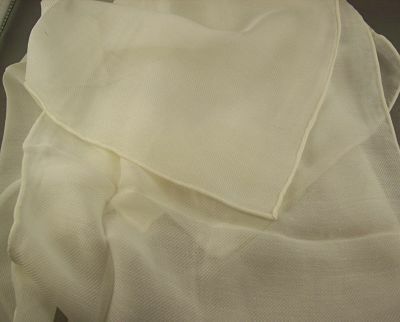 The material is hand hemmed with silk thread, and the diagonal weave means it drapes beautifully. These can be dyed with either the Earth Palette Wool Dyes, or the Silk Dyes. They are warmer than the plain Silk scarves, and quite soft for those who usually find straight wool a bit itchy or irritating. These scarves measure 28cm wide X 150cms long.